The human body is a machine. In fact, it is arguably the most efficiently designed machine known to humankind. A popular home-fitness machine was once marketed by describing the human body as the only machine that gets stronger the more it is worked. When you consider a more familiar machine, such as an automobile, it is not difficult to understand that occasionally parts break down and need to be repaired or replaced in order for the automobile to continue functioning as designed. Keeping up with regular chiropractic visits is crucial to your body and its natural adjustments throughout your life. Our experienced chiropractic care physicians in St. Paul are trained constantly and eagerly to regain the comfort in your body that you once had. 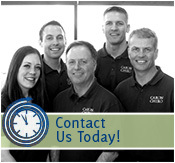 Call Caron Chiropractic Clinic today and set up an appointment to live pain free tomorrow! Chiropractic Care fits in beautifully with your goal of Living a Healthy Lifestyle. The treatments can stave off a myriad of health problems including joint pain, headaches, backaches, muscle stiffness and illness. During your scheduled visit with one of the Licensed Chiropractors at Caron Chiropractic Clinic, P.A. be sure to mention all symptoms that you are experiencing. Include symptoms that may seem irrelevant or unrelated to your spine or joint discomfort. Never minimize your symptoms. Providing an honest and detailed account of every symptom can help with your diagnosis. All conversations with your Doctor of Chiropractic Care will be held in the strictest confidence.